I realize the World Series is being played this week, but I am already looking ahead to next year, much like fans of the other 28 teams are doing. Congratulations are due to the Cardinals and Rangers for their dedication and hard work. The Cardinals season looked all but over at the All-Star break. Pujols was ineffective and injuries plagued the team, including losing their ace for the year. The Cardinals reminded us who they were as the season progressed and that persistence has paid off. The Rangers took a tough loss last year, and everyone except the Yankees knows how difficult it is to get back to the World Series. Congrats, and I will be watching; but I’m moving on and looking to next season. 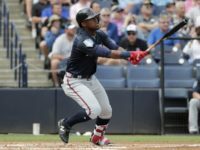 Predicting a baseball player’s performance is tough enough at the major-league level, much less trying to project when a minor leaguer will get the call up and how he will perform. But, that is exactly what I will do in this edition of The Heat Index. Let’s dive in. He got a taste of the big leagues near the end of the season and was possibly the most productive player outside of Jacoby Ellsbury for them. Lavarnway will still be rookie-eligible next season and will go into spring training with the chance to steal the starting job away from Jarrod Saltalamacchia. He is ready and just needs an opportunity to show what he can do. In 39 ABs, he hit two homers, drove in eight runs and provided decent defense behind the plate in September. Prediction: He plays at least 100 games next year and hits .250 with 18 home runs and 60-70 RBIs. Tampa Bay got a small sample of what Moore can do, and they soaked up every last drop of it. Moore pitched 9.1 innings at the end of the regular season and struck out 15 batters while posting a 2.89 ERA. His better performance came in the postseason where he pitched 10 innings with 8 Ks and a 0.90 ERA. Moore will definitely part of a very potent rotation next year with or without David Price. His performance may even allow the Rays to trade Price without worrying about the hole it leaves in the rotation. Prediction: Moore will go 15-10 with a 3.80 ERA and 200 Ks in 160-170 innings. Jackson’s name has been mentioned in the Theo Epstein trade rumors, and if I can give the Cubs one piece of advice, it’s don’t let him go. Jackson should be considered for a job in the Cubs outfield next year as he should be able to outplay Tyler Colvin, at the very least. In 48 games at triple-A last year, he hit .297 with 10 home runs and 26 RBIs. He also has some speed, stealing 30 bases in 2010. The Cubs have nothing to lose by giving him a chance right out of spring training. He does have a strikeout problem, but if he hits in the right spot in the lineup, it should allow him to see some good pitches. Prediction: .279 with 16 homers and 50 RBIs while playing great defense anywhere in the outfield. If they let him run free on the basepaths, he may also have 20+ steals. This prediction is a little harder because it depends on many variables, including C.J. Wilson‘s whereabouts and Neftali Feliz‘s role with the club. Alexi Ogando also might be moved to the rotation if the Rangers can’t land a top-of-the-rotation pitcher in the offseason. Having said all that, Scheppers is ready for the show. He is 24 and isn’t getting any younger, so there is no reason why the Rangers shouldn’t give him a shot to show what he can do. Whether that shot comes in the bullpen or the starting rotation will be determined by the previous variables. He has been pitching out the bullpen more frequently as his career has progressed and that would be my guess as to where he ends up. Scheppers should be able to easily step into a set-up role and if things go his way, maybe even a closer. Prediction: 2.72 ERA as a setup man with 60 Ks in 62 IP, as the Rangers try to repeat as WS Champs (yes, that is my prediction for the WS Champs). This is probably my most risky pick of this list for many reasons. First, the Brewers already have a third baseman, Casey McGehee, who many analysts have said could be traded to save the Brewers some cash next year. My thought would be to keep McGehee and pay him the projected $3.1 million in arbitration while moving Green to first base to fill the hole left by Prince Fielder. Green has played a few games at first, and I don’t think it would be too much of a stretch for him to become adequate defensively by 2012. Regardless of where he plays, Green’s bat should be in the majors. He hit .336 in 120 triple-A games this year with 22 HR and 88 RBIs. He won’t make up for the lost production of Fielder, but he should provide some consistent production. Prediction: .291 with 15 HR and 80 RBIs. Count on lots of doubles to drive runs in.